This Yale graduate is digging for her ancestors' stories and discovering who she is in the process. Beatrice Medicine, Sihasapa Lakota anthropologist, stated the following regarding her position as a Native American anthropologist: “The ambiguities inherent in these two roles of being an “anthro” while at the same time remaining a “Native” need amplification. They speak to the very heart of “being” and “doing” in anthropology. My desire to be an anthropologist has been my undoing and my rebirth in a very personal way”. Beatrice Medicine recognized that her position as a Lakota anthropologist came with a very unique opportunity to explore the discipline and reconstruct it in a way that worked for her and her people. My own position is very similar. As a female Sihasapa Lakota archaeologist, I have the ability to walk in two worlds. I not only research Lakota culture, but I am a part of it every day as I learn our language, participate in our ceremonies, and advocate for our people in every aspect of my life and academic career. I first became interested in anthropology and archaeology when I took Introduction to Cultural Anthropology and Great Civilizations of the Ancient World, as a sophomore in college. I was struck by the fact that “experts” would make sweeping claims about Indigenous peoples and their cultures without ever experiencing certain ceremonies or being part of the culture. What was more shocking was, in an archaeological context, that cultural objects, artifacts and even human remains were taken and placed in museums without any Indigenous persons' consent or any consultation with tribal peoples. I grew frustrated that this discipline largely ignored Native peoples, but I was excited that the discipline was also one of open-mindedness. I then set out to gain as much practical experience in the field as possible. I began working at the Yale Peabody Museum of Natural History as a volunteer in their archives. I also became their Native American Graves Protection and Repatriation Act (NAGPRA) grant assistant. This was my first exposure to NAGPRA, and I soon began working to photograph and analyze over 1,200 ethnographic Alaskan Native objects at the Yale Peabody Museum in a collection that had remained relatively untouched since the 1960’s. I also learned the legal ins and outs as well as the importance of the 1990 passing of NAGPRA, which was a law designed to protect Native peoples' objects and remains. I soon began to go on archaeological digs at sites in Spain, Japan, Peru and Utqiaġvik (Barrow), Alaska. After my summer in Spain on an archaeological dig, I became increasingly aware that I wanted to go into archaeology in a truly fulfilling and engaging way. I decided that I wanted to study archeology in the United States and work on not only engaging tribal communities but consulting with them every step of the way during archaeological digs; from surveying potential important sites, to putting the trowel in the ground, to finding objects and asking the tribe what to do with them. I do not believe that archaeology can be a successful practice and methodology of understanding the past without the full engagement of tribal communities, on whose land so many archaeologists dig. My journey as a Native woman in a predominately western discipline has been deeply personal to be sure, but it has also been instrumental in providing a better understanding of the journey of my Lakota people. Walking in two worlds is something many Native scholars navigate as we attempt to tell the stories of our ancestors through colonial, academic disciplines. As a member of my tribe and my heȟáka oyáte (family), I frequently participate in our ceremonies, and I learn our songs and our language. My aunties and uncles help me to learn these traditional ways and I, in turn, talk to them about my research and how it relates to our people and culture. Walking in two worlds has allowed me to see the continually developing culture of my people and how it far precedes any “American” culture or government. The material evidence and rock art that my people have left behind is important, and with the support of my family and oyáte and my education, I am discovering my ancestors and the lives they lived. Oglala Lakota writer and intellectual Delphine Red Shirt once said “I think about all those things that we Lakota have lost through time, the things that I have lost in my childhood, in my lifetime... But those things that are infinite, we never really lose.” I believe as an indigenous archaeologist and a member of my tribe, I have a duty to find the things we may have lost in the past and bring them back and revitalize them for the future generations. Emily Van Alst is of Sihasapa Lakota descent. She graduated from Yale University in May 2016 with a double major in archaeology and anthropology. 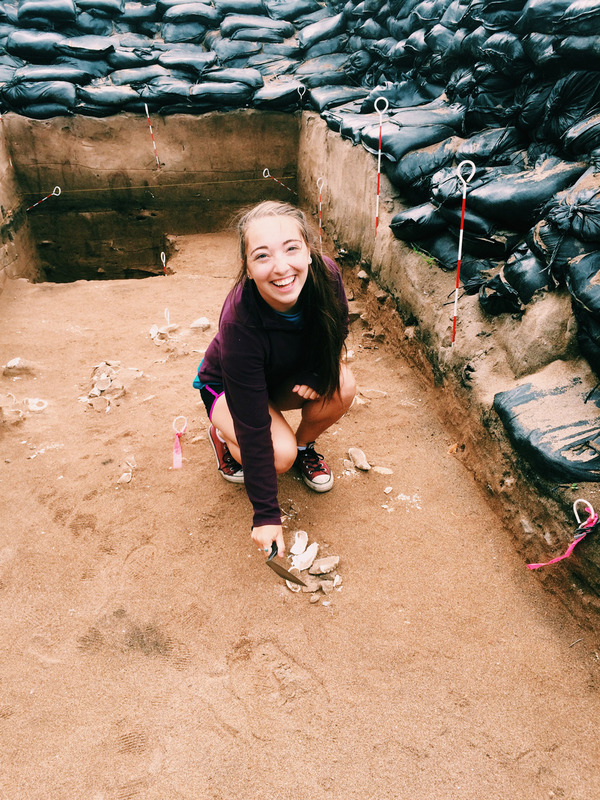 Her archaeology senior research was a comparative thesis on the treatment of Indigenous archaeology in the United States and Japan. 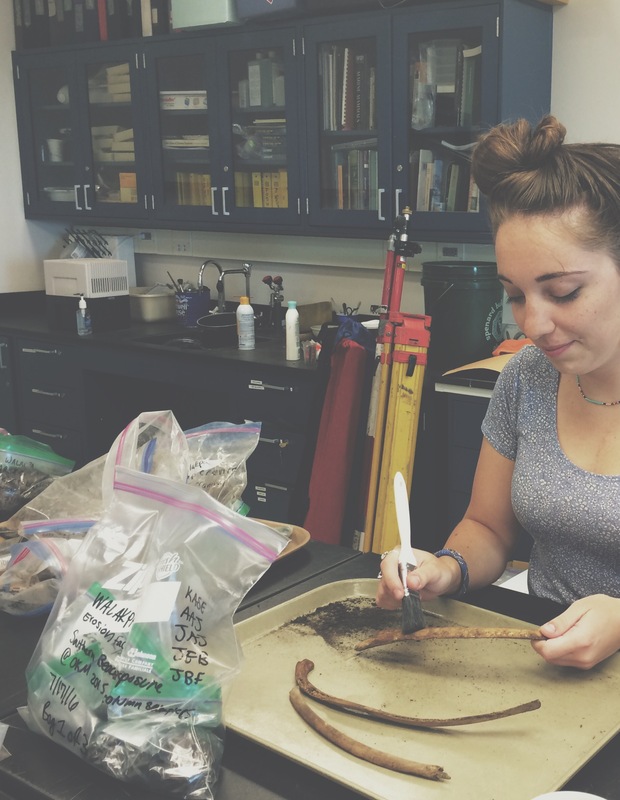 She will begin graduate school this fall working towards a Ph.D. in Anthropology/Archaeology at Indiana University with an emphasis on community outreach and engagement, zooarchaeology, Indigenous archaeology and the Northern Plains. She works with the “Learning NAGPRA (Native American Graves Protection and Repatriation Act)” project through Indiana University.